- Billy and Anne declaring their love for each other. - Amy and Damien kissing. - Drew seeking Karl's permission to marry Libby… which is overheard by everyone! - Drew popping the question to Libby. - A fire being discovered at #26. - Realising that Lolly is still inside the burning house. - Tess confirming that Brendan was the one who injured her. - Drew going into the burning house to rescue Lolly but finding himself on fire as he exits the house. - Karl updating the ambos on who is injured. - Drew being taken off to hospital. 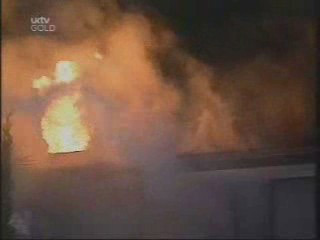 - The Scully's scared/tearful at seeing their house on fire. Drew and Lolly are both rushed into the hospital. Karl goes to go with Lolly but not before he's asked a nurse to keep an eye out for Drew, because of the connection, and explains his injuries to her. Flick asks where the dog is and Lyn (backed up by Susan) reassure her that he is safe and well. Joe mutters that the dog is the least of their worries and goes to go into the house. Lyn freaks out that it's too soon but he reassures his wife that he's simply checking things out and tells her to take the kids to #28. Susan tells the Scullys come in and with Tess's help, gets them blankets and hot tea. Lyn does her best to reassure Michelle while at the same time telling Flick to say put and not head to #26. Susan thinks she has guests for the night but Lyn is sure the bedrooms will be okay for them to sleep in, but Michelle doesn't want to go home. Joe and the emergency services check out how badly damaged the house is. Libby and Billy are waiting for news at the hospital when Karl appears and gives them an update. Considering what has happened, they aren't too bad according to Karl. Another nurse approaches Karl to say that Lolly is going to be kept in overnight and is asking for her Dad. Lou is still stuck interstate so Karl volunteers to go sit with her. Libby asks the nurse about Drew and all he can say is that Drew is in the burns unit but will see if he can get someone to come and talk to her. Billy suggests she should have said she was engaged to Drew (the nurse asked if she was related to him) and they might have let her into see him. The police leave the house and Joe starts thoroughly checking out how bad the house is. A new kitchen is in order at the very least! Libby tells Billy to head off but he is happy to stay. He asks his sister if she's going to marry Drew, but she says she can't think about it right now although he points out that the street will think it's a foregone conclusion! LIBBY: I can't make decisions about my life because of what the whole street thinks. Billy gets that and asks if she can see herself married? “I don't know,” is her honest reply although adds in a “hopefully” to the reply but isn't quite ready for the fuss Susan will make! BILLY: Are you kidding, dad will be heaps worse! He hopes that won't put her off saying yes though! Libby wonders why he is so keen and his reply this is the first decent guy she's met and should grab him before he gets away! “That's a big put down,” Libby jokes with her brother and is happy to hear that he and Anne are back together. “You've been a pain to live with since you two broke up,” she points out and tells him to head back home to see Anne, she will be fine. Lance is fretting because Amy hasn't turned up yet despite her plane landing ages ago. Toadie just thinks she's gone partying as Billy arrives with an update from the hospital and asks to stay since #28 is rather full with the Scully's/Tess. Anne is talked into staying too as she doesn't like being at the Greenwood's without Amy. The Scullys all return to their house now all the firemen have gone. Flick complains about the smell and how things look, but Joe is being very positive and says he'll have everything back to normal in next to no time. Lyn tries to put a brave face on that at least the bedrooms are fine. Flick blames Michelle for the fire because she left Lolly on her own with the sparklers (it appears Lolly lit one of the sparklers as the fire started on the table). When the kids retreat to their rooms and Susan leaves after Lyn reassures them they will be fine in their own house, Lyn cracks, wishing they'd never moved here. Joe rallies his wife and eventually she comes to and at least this time she might like the paint the house is decorated in! Billy heads across to #30 with his stuff (despite the Scullys going back to their own house!) and gets a brief update from Karl as they pass each other at the door. He is home because Lolly is fine and is sleeping however she is asking for her dad. Karl is reluctant to call, because of the time, until morning however at least he can reassure Lou that she is alright. Susan doesn't like the thought of Lolly being alone so plans to go to the hospital and persuades Tess to stay on even though she wanted to leave. Drew is woozy after the painkillers he has been given and asks how Lolly is told she's fine but is being kept in overnight. Libby praises him for being a hero, something he is keep to play down. Before he heads back to the land of nod, he asks if she remembers what he asked her. She does, but wants to talk about it in the morning when they are both making sense. Meanwhile, Lolly is still sound asleep when Susan arrives and the nurse tells her she doesn't need to stay but she wants to. Karl orders Susan back to bed to get more sleep but she reassures him she is fine. He heads off to bring Harold up to date and to get Lolly's teddy from #26 as she's been asking about it. LIBBY: Mum, do you think I am too young to get married? SUSAN: Well if you need to ask your mummy, you probably are. Both admit to being surprised by Drew's proposal and Libby admits she doesn't know what to say because she was shocked and Susan suggests taking her time before reaching a decision. “I don't want to hurt him,” Libby says to her mum and she knows that, “he is a lovely man,” Susan adds. There is a knock at the front door and neither are up for visitors but looks like they've no option but to be hospitable, Drew's parents (Ron and Rose Kirk) have just arrived! The visit is an impromptu one and act as if Libby has already said yes to Drew's proposal! Commercial break later, Libby and the Kirks head off to see Drew at the hospital. Tess surfaces once they've left and wants to be gone before everyone returns. Susan reassures her that despite the craziness of last night, she mustn't feel unwelcome and volunteers to cook brekkie. Joe comes off the phone to say that the insurance assessor will be round later that day. He is making a list of things to buy (like a kettle) when Karl drops by to get Lolly's teddy but sadly it's been burnt. Flick volunteers to give her one of Michelle's since she's got loads and has another dig at her sister for Lolly ending up in hospital. Joe in turn isn't pleased at Karl leaving 12- year- old Michelle in charge of a toddler and Michelle is clearly upset at hearing what has been said and runs off to her bedroom. “I don't believe you said that,” Lyn tells her husband after Karl leaves, but he's unrepentant because it was the truth. Drew tries to downplay what happened to his parents when they come visiting him although Libby still calls him a hero. Rose wanted to come and offer the happy couple their congratulations in person and wants them to visit Oakey for the formal introductions to the family as she knows the wedding is likely to be in Erinsborough. Drew plays happily along for his parents while Libby stands cringing at what is going on.